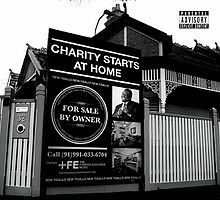 After success with Little Brother and his Foreign Exchange music, Phonte branched out in 2011 with his first official solo album "Charity Starts At Home". With his comedic timing in verses, knack for lyrical dexterity, and ability to make relatable music, Phonte created a near classic that still stands up and is an almost non-skip listen. The intro of sorts "Dance in The Reign", features an aggressive Phonte that hadn't been heard since the Minstrel Show era. The beat is that knocking boom bap along with some electric chords and synths to give it an epic feel to start off the album. When the sound of "The Good Fight" starts, it signals the official reunion of 9th Wonder and Phonte after the Little Brother breakup around 2007. 9th provides a simple soul sample for Phonte to express his frustration with the game and the battle between keeping it hip hop or going with what works. He comes with some honest lyrics on "Everything Is Falling Down", which leads right into the Elzhi assisted "Not Here Anymore", as 9th provides the smooth sound bed for both MCs to spit their best. The feeling in this album is full of hope yet the realism of what the world brings and dealt us. The Median assisted "Eternally" definitely is reminiscent of the Little Brother era, as the beat from 9th is that boom bap greatness we have always loved. The back and forth between Phonte and Median is that good ol' Justus League chemistry shining through yet again. Phonte has always made songs for relationships time after time and he does this yet again with the back to back "Sendin' My Love" and "Ball and Chain", discussing the toughness of maintaining that very relationship. Then he continues this series with "To Be Yours", which shines with the horns carrying the vocals of Phonte to create something amazing before leading into another chapter. Phonte manages to bridge the gap between his Little Brother era and Foreign Exchange era with this album, and on "Gonna Be A Beautiful Night", it sounded like a leftover from a Foreign Exchange album. That doesn't take away from the song at all, it just fits the vibe perfectly and with Carlitta Durand assisting, that FE sound was heavy. The album sequencing here was slept on as well, as the album starts with that pure hip hop sound, aggressive rap then leads to the melodic FE sound, before coming back around yet again to rap with "We Go Off", the Pharoahe Monch assisted anthem. Phonte shows off his diversity in full force on this album, and as we near the end of the project, he provides with a classic all time track. "The Life of Kings" is definitely a top 2-3 song on this album and one of the best Phonte songs ever, and features Evidence and Big K.R.I.T. as well. While I'm not a big Evidence fan, he does his thing, as does Phonte as expected. The artist who steals the show a bit however is K.R.I.T., as his verse features many quotables, the most diverse flow and his delivery was flawless on this track. This track might be my personal favorite on the album and I can run this back time after time. The final song "Who Loves You More" showcases Phonte once again revisiting the relationships topic to an extent, with an underlying message of personal choice involved in doing what you want versus doing what's truly needed. That's the beauty of this album honestly, Phonte creates a project that's rooted in choice and allows himself to show you different paths and perspectives inside one album. Phonte to me, as an artist is a genius and despite him proving it in Little Brother and Foreign Exchange, he managed to do it by himself solo wise as well. Revisit this album and enjoy.